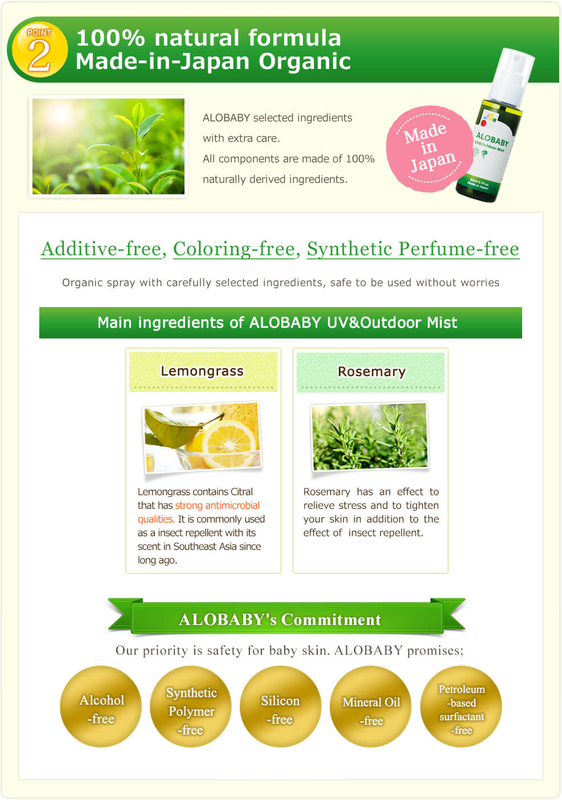 ALOBABY is an organic baby skincare brand, purely made-in-Japan, and was born from a mother's love to her dearest baby. All of our products are organic and contain more than 99% naturally derived ingredients, which guarantees safety and comfort even for a newborn baby. We are also ranked the No.1 Seller in the baby skincare category on Rakuten and Amazon - top 2 leading online shopping sites in Japan. I frequently use ALOBABY's UV & Outdoor Mist on my 10-month-old daughter. What I love the most about the mist is that it is made from 100% naturally-derived ingredients and is DEET-free. It has protected my baby and I from Japan's strong UV rays! This mist has also definitely eased my concerns about the ZIKA virus outbreaks. Q1Is it safe to use on my baby's face? Yes. It can be used on the face. However, please avoid contact with the eyes. In case your baby (child) refuse, we suggest mothers to spray the mist on their fingers and apply to the baby (child). Q2Can I use it for a newborn baby? Yes. It can be used on a newborn baby to adults with sensitive skin from head to toe. With the 100% natural formula, it would not cause any problem even if baby (child) accidentally ingested the product. However, in case a large volume is ingested, please consult a doctor. Q3When is the expiration date? 1 year after opening date. 3 years after manufacturing date. Please avoid direct sunlight, high temperature and humid place for storage. Q4How long does the protection last? It lasts about 5 hours based on the formula of SPF index, (SPF15) multiplied by 20 min. However, it is suggested to re-apply every 2-3 hours with sweaty skin to ensure maximum protection. Q5Can I rinse it off with warm water? Yes. It can be rinsed off with warm water without need of special cleansing agent. If you have concerns residuals, please use baby soap. In any case, please wash gently, scrubbing is not recommended. Q6What is the difference between UV&Outdoor Mist, UV Cream and Outdoor Spray? There is no difference in SPF and sunblock effectiveness. However, cream form may be suitable when your baby (child) refuses to use the mist or when you apply for a small part of body. There is no difference in repellents effectiveness. However, the solution in UV&Outdoor Mist is rather white due to UV protect essence while Outdoor Spray is clear. Made-in-Japan organic Milky Lotion is ALOBABY's signature item. It provides high moisturizing effect and is certified by the world-known ECOCERT. Contains natural moisturizing ingredients, such as Jojoba Oil and Shea Butter. Made of more than 99% of natural derived ingredients that provide deep moisturizing effects. 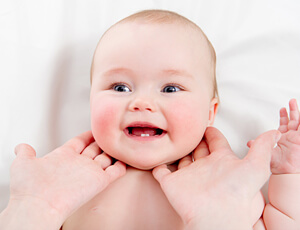 The skin of a baby is thinner than of an adult and hence it dehydrates quicker. 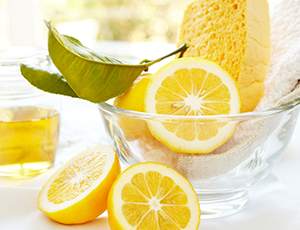 Jojoba Oil and Shea Butter helps to moisturize babies' delicate skin. 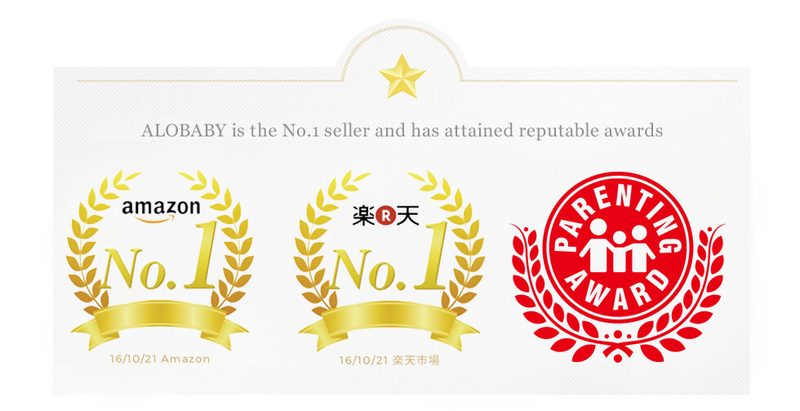 ALOBABY Milky Lotion is highly rated by customer reviews on two of the top leading online shopping sites, Amazon and Rakuten in Japan. Made in Japan quality, safety is promised for babies. Certified by world-known organic standard, ECOCERT. ALOBABY strictly focuses on the ingredients, the product pleasantness and safety. 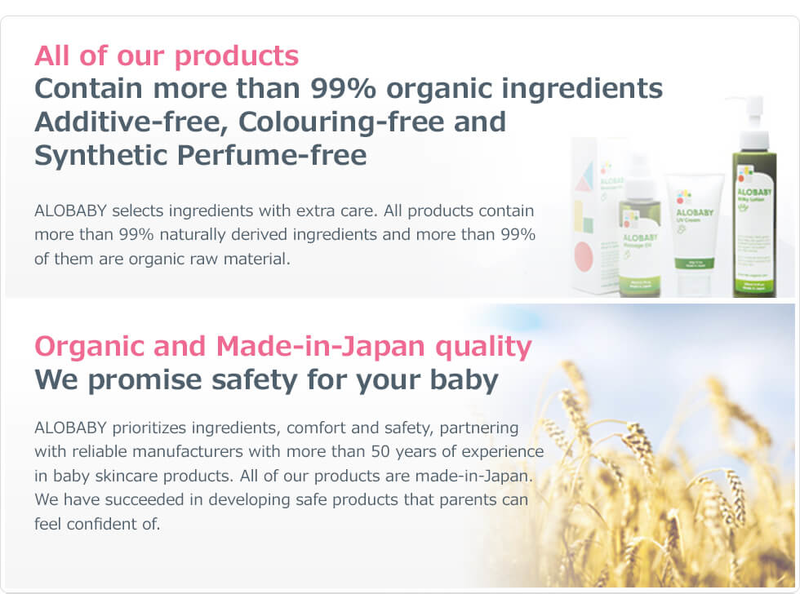 By cooperating with experts with over 50 years of experience in baby skincare products, and by having the entire manufacturing process conducted in Japan, we have achieved in developing safe- and confident-to-use products. 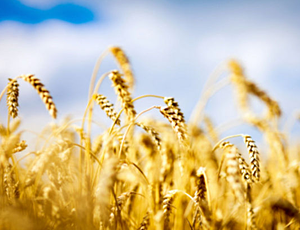 We are highly strict and sensate in selecting ingredients, usability and safety. Our products, made in Japan in every single stage in a safe environment, will provide high-level safety. Contains Jojoba Oil and Shea Butter. Suitable for use for pregnant women and mothers, also directly after giving birth. Natural derived formula provides deep moisturizing effects with Jojoba Oil, Shea Butter and Olive Oil. Easy to spread and can be used from newborn to adults with sensitive skin. It is also suitable for pregnant women and mothers to use. Made-in-Japan organic UV&Outdoor Mist provides UV protection and insects repellent effects. Our 100% natural formula is DEET-free and does not contain synthetic UV absorber. It does not cause white marks after application. Portable size in spray form, suitable for outdoor use. 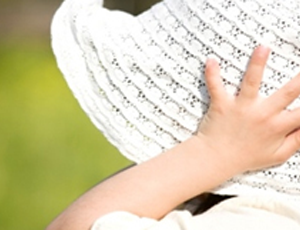 babies' skin from harmful UV rays and effectively repels insects and bugs. Ideal product to use before heading outdoor, and convenient for outdoor reapplication! 2 in 1 formula helps busy mothers before heading out, especially in the morning. Portable size enables mothers to apply mist on the baby easily. It protects skin from UV and insects outdoors. Does not cause white marks on skin after application and easy to rinse off with warm water.Natural formula ensures your baby's delicate skin is protected. 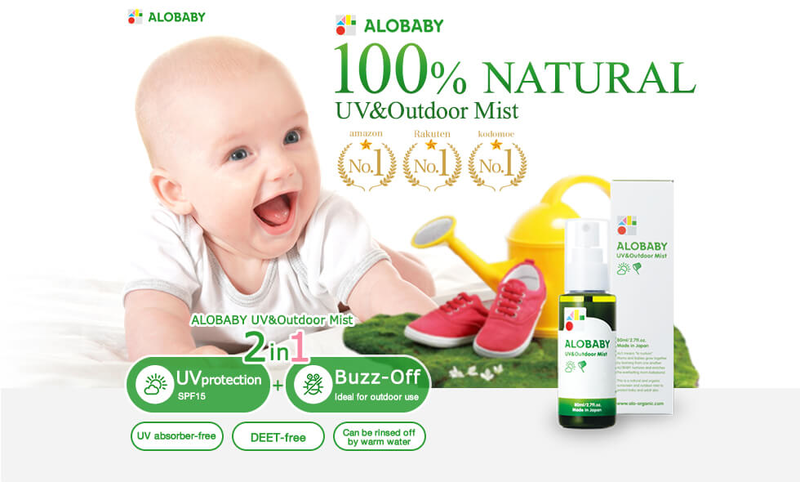 ALOBABY UV&Outdoor Mist contains fine particles that are naturally scattering UV lights in the form of a mist, leaving no white marks on skin, which is normally likely to occur with organic sunscreen. 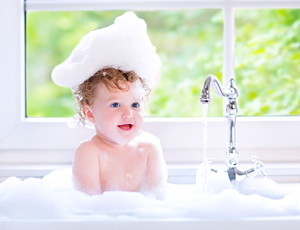 Because it can be easily washed off with warm water, it is not necessary to scrub the baby's skin even in the bath, minimizing the irritation to the skin. Generally insect repellents come with unpleasant scents, but ALOBABY UV&Outdoor Spray carries a rather natural barrier with a fragrant aroma. The mist does not carry the unpleasant sunscreen or insect repellent scent, but rather with a natural aroma from lemongrass and rosemary leaves. The fragrance is very subtle and does not irritate babies. can be used on babies safely. ALOBABY UV&Outdoor Mist is formulated with 100% naturally derived ingredients, focusing on the gentleness to the skin. 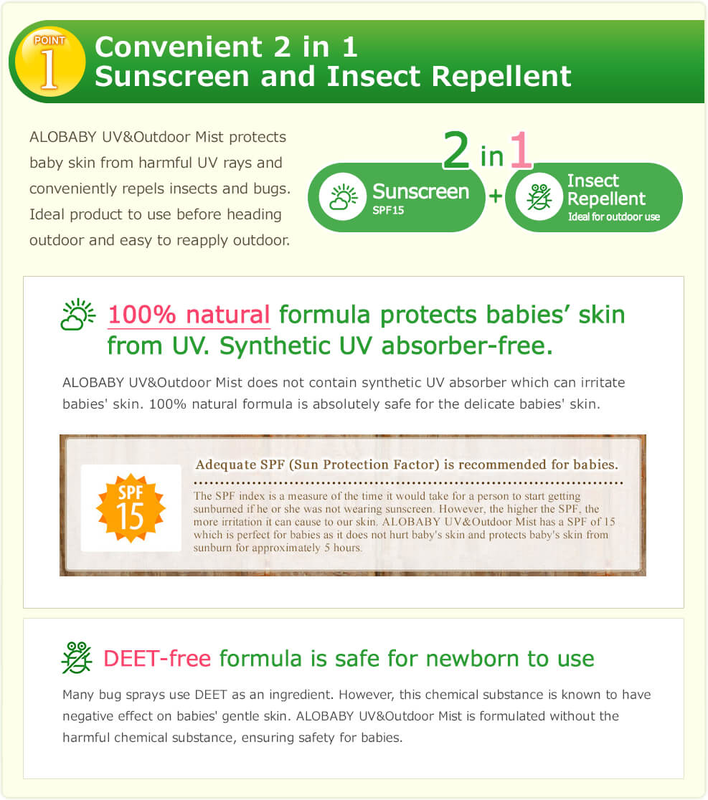 Unlike many sunscreens or insect repellents, ALOBABY UV&Outdoor Mist does not use any synthetic UV absorber or DEET as ingredients. Therefore, the product is safe to use on babies without creating any irritation. Adults with sensitive skin are also recommended to use the product. Produced by Japanese celebrity and child body therapist, Eri Ebihara. Made-in-Japan organic baby massage oil contains rare natural oil extracted from God's Tree. Marula Tree, commonly known as the God's Tree, is well known with its abundant nutrient and medical usage in Africa. The oil is easy to spread and the non-sticky texture provides comfort when it is applied. Made-in-Japan organic baby soap conveniently provides an appropriate amount of foam with one hand push. 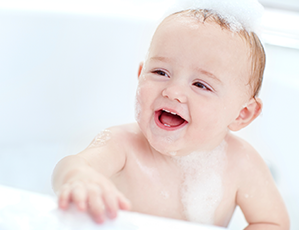 Creamy foam cleans babies' delicate skin gently and is washed off easily with warm water. Foam does not remain on skin, avoid causing irritation. It is made of more than 99% natural derived ingredients and can be used from head to toe. 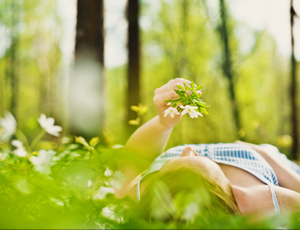 Made-in-Japan organic Outdoor Spray repels insects with natural derived aroma. It is made from Orange Fruit Water, Lemongrass Oil and Rosemary Oil. Ideal DEET-free formula protects baby's skin gently. Made of more than 99% natural derived ingredients. Contains natural aroma that repels insects. Contains Orange Fruit Water, Lemongrass Oil and Rosemary Oil that creates a refreshing aroma and protects skin from insects gently. An organic outdoor spray that is made of more than 99% natural derived ingredients. Suitable for pregnant women and mothers. DEET-free and made of more than 99% of natural derived ingredients promise its safety. 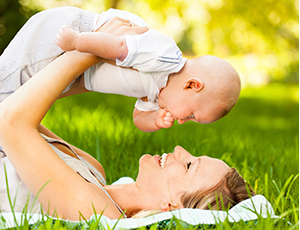 An organic outdoor spray protects not only the baby but also pregnant women and mothers. The ideal outdoor spray allows safe and happy outing time. Made-in-Japan organic UV Cream does not contain Synthesis UV absorber. ALOBABY UV Cream is made of 100% natural derived ingredients and can be rinsed off with warm water easily. Easy to spread and the non-sticky texture makes it easy to apply on skin. No synthesis UV absorber used. Made of 100% natural derived ingredients. No synthesis UV absorber used but made with 100% natural derived ingredients formula protects delicate baby skin gently. The organic UV Cream prevents UV rays that may be accumulated on skin, cause pigmentation and freckles in the future. 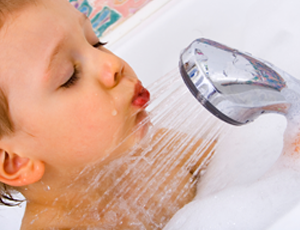 Easy to rinse off with warm water. can be used as daily skincare. Easy to apply at both indoor and outdoor with its non sticky texture. Does not cause white marks on skin after application, suitable for pregnant women and mothers to use as make-up base. 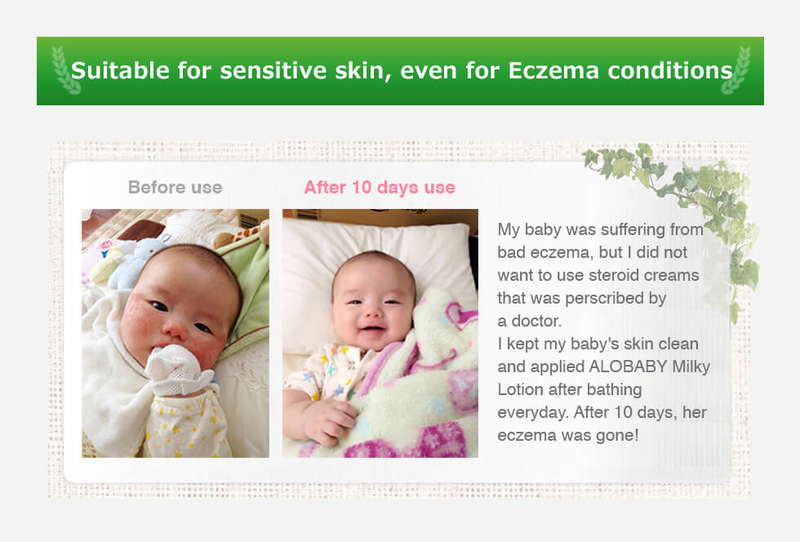 Made-in-Japan organic Baby Bottom Cream relieves inflammation such as diaper rash. This bottom cream contains Crame Maritima and Sambucus Nigra extracts that help to enhance skin’s barrier function. 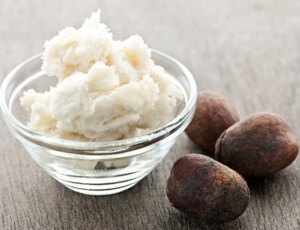 The presence of Shea Butter makes the cream easy to spread on the delicate zone. Naturally derived ingredients such as Crambe Maritima Extract strengthen the protective layer of the skin and relieve inflammation caused by irritations such as diaper rash. This Baby Bottom Cream enhances the original skin's power, thus suitable for relieving inflammation but also for daily moisturizing. ALOBABY Baby Bottom Cream is non-scent type, so suitable to use around bottom area. In addition, the luxury high blend of shea butter helps to spread on the skin easily, so it can be gently applied to delicate parts. ALOBABY Baby Bottom Cream does not contain any silicon or paraben that are used in many creams. "Confortness on skin" is always our top priority and it contains more than 99% naturally derived ingredients. Therefore, application of this cream leaves no white residues or marks on the skin. Copyright © ALOBABY All Rights Reserved.